This is not the first time that George attempted to delegitimize his opponents rather than to engage substantively on the policy issue. George could have reiterated policy arguments for the Purple Line, discussed the damage in the delay of decision, or disputed the legal reasoning. Instead, he took a shot at the participation of people standing up for their viewpoint as to what is best for their community. This line of attack is particularly odd since the other side is supported by the weight of the State, the County, the FTA, and the wealthy development community. Regardless, it is unusual to see a politician bemoan their constituents’ participation in the process. I do hope someone will ask who paid for the signs. Who gave them to you? Who will pay for those signs next? And who will hire the lobbyists to distribute those signs next? I guess we need to warn the PTA when they come and they have their pre-printed signs, we need to warn Moving Maryland Forward, or the Purple Line Coalition, or Wheaton Moving Forward. We need to warn everybody not to have pre-printed signs because that automatically means that your voice isn’t your voice, it’s somebody else’s. Well, I don’t agree, and I think that you being here is enough of a word that says that you care about what happens in your community, and that’s enough for me! 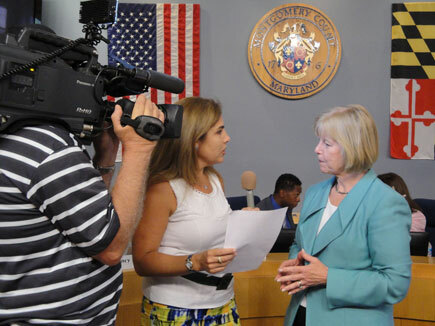 All four Montgomery County Council incumbents elected at-large are running for reelection: Marc Elrich, Nancy Floreen, George Leventhal, and Hans Riemer. Two challengers are also in the race: Beth Daly and Vivian Malloy. Both are credible candidates. Nancy Floreen and George Leventhal joined the Council in 2002 as part of County Executive Doug Duncan’s “End Gridlock” slate. Elrich lost that year but joined the Council when tides turned in 2006. Hans Riemer lost the primary for the District 5 seat to Valerie Ervin in 2006 but unseated one-term incumbent Duchy Trachtenberg with Valerie’s support in 2010. Gauging the shape of these primaries is difficult. In a county of roughly 1 million people, the county government–equivalent to the city council of a city of the same size–remains much less known than it deserves. Indeed, for the challengers, one of the main problems is getting sufficiently well-known to pose a serious challenge. None can afford to advertise on television in this very expensive media market. Communication through the mail, in person, and now through social media are the central means of voter contact. All also race around the county following a brutal schedule that makes me tired just thinking about it. Oddly enough, the Council’s most conservative and liberal members seem safe. 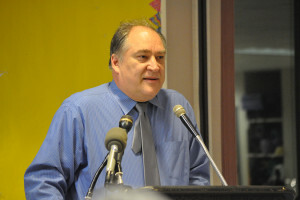 In his first reelection bid in 2010, liberal Marc Elrich came in first by a mile despite being underfunded as usual. He is best known for his relentless advocacy of a countywide bus-rapid transit system–an indication of a willingness to work with development interests that he is better known for opposing. Marc’s BRT plan still strikes me as the most innovative and future-oriented vision for the County. It has the potential not just to aid the County’s transportation needs but also to promote economic and job growth in a sustainable way over the long term. Nancy has been a leading voice on the other side, successfully promoting revision of zoning laws in a developer friendly manner. While part of the County’s liberal consensus on social questions, she also has staked out conservative positions on other issues, such as her opposition to the county bag tax. Even as she argues tenaciously for her positions, Nancy also does a good job of keeping in touch with all sides. Despite being seen in many ways as the Chamber’s closest ally on the Council, she is also occasionally willing to deviate from this pattern, particularly when pressed hard by well-organized large civic groups. Both Marc and Nancy are smart, opinionated lawmakers who utterly disagree on many big issues before the Council. Is today’s snowstorm going to put a dent in County Executive Ike Leggett’s reelection prospects? It has been a long winter and Montgomery County ran short of salt to pre-treat the roads for the storm. In many areas, the streets were first plowed before they were salted, uncovering a sheet of ice underneath the snow that will now likely to have to wait for warmer weather–not to arrive for at least a couple of day–to remove. Smaller municipalities were especially hard hit. At first, the the County did not even want to release any salt to smaller municipalities that rely on it to supply it through longstanding arrangements. They were not happy. These problems play into Doug Duncan’s strengths. As County Executive, he was known as an avuncular guy focused on handling basic services very well. To the extent that the storm weakens Leggett’s reputation for the same, it could help Duncan and hurt Leggett. The impact depends on three factors: (1) the severity of the problems, (2) how well surrounding jurisdictions do, and (3) whether Duncan is positioned to take advantage of it. My quick peek at traffic cameras around the County indicate that many major streets are looking good, though some still have problems. If DC and Prince George’s open the schools but Montgomery does not, the County Executive will likely face at least some grumbling and have to answer questions about the lack of preparation. Winters vary in the amount of snow they bring, and residents rightly expect that the County will get more salt if needed. But if the schools in all three close, it looks like we’re all in the same boat. Normally, our County officials do not get much attention. Not because they don’t merit it but because our news media covers the entire metro area. They choose to focus their coverage heavily on the District even though Montgomery, Prince George’s, and Fairfax all have far more people. Bad events, however, can turn their gaze in our direction to the disadvantage of incumbent officials. It will be also interesting to see if members of the County Council raise questions about the level of preparation or choose to stay mum. Some may want to exaggerate and make the inevitable recollection of the disastrous handling (really non-handling) of snow in DC by Marion Barry on one famous occasion. Bad analogy. Leggett is not Barry. He’s the anti-Barry: a steadfast calming, often quiet, problem solver. Moreover, these problems are a minor hiccup compared to that fiasco. Don’t go there.